His first pick up line was 'So, do you like books...?' - classic work Ross! A little while later and I was the celebrant for their wedding on the Mornington Foreshore. A couple of DIY dynamos they self-catered the reception at the local hall and Laura made her own wedding dress! Anthony was the celebrant for our wedding in March. As someone who had wanted a super short, legal-bits- only, registry office ceremony, and who truly believed that the ceremony was the boring, slightly uncomfortable part that had to be endured before the real celebrations could begin, I couldn’t be happier to have been proven totally wrong, and can’t recommend Anthony’s celebrant services highly enough. From the very first meeting, Anthony made us feel super comfortable and allowed us to be ourselves. He was able to guide us through the process of designing a ceremony that felt like us, and was totally comfortable with us adding to and subtracting from the standard wedding arrangement as much as we liked. 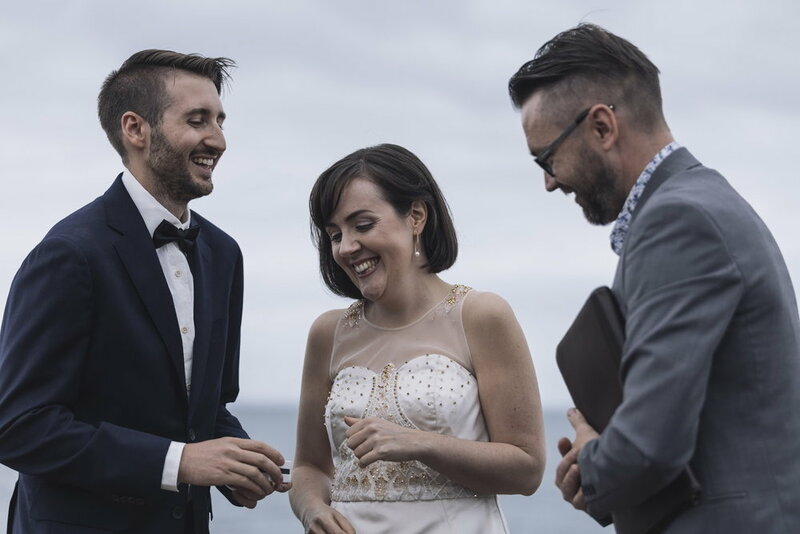 On our wedding day, Anthony was a calming and relaxing presence, helping manage the last-minute anxieties and nerves, and delivered such a beautiful, hilarious, emotional, respectful, fun ceremony that was perfect for us and which we will always remember with great joy. Immediately after our ceremony and in the weeks that have followed, our friends and family who attended have told us that it was the best and most unique wedding they’ve ever attended, and that the ceremony was so perfectly ‘us’. The laughs, tears and words we shared set the tone perfectly for the whole evening of celebration that followed, and ensured that our wedding ceremony was both as open and as private as we wanted it to be.